This New Moon in Virgo is a potent seeding time that will wax into the fifth and final Super Moon of the year, this time in Pisces. Mercury, angelic messenger and guide of souls, is the ruler of this New Moon and gracefully moving as an evening star through his exaltation of Virgo. 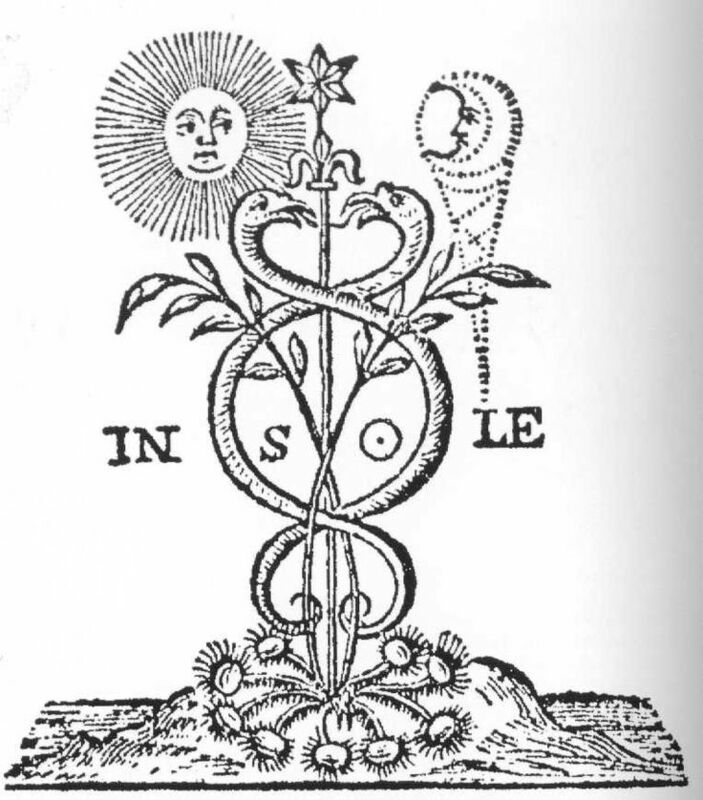 Mercury is beyond fifteen degrees in front of the Sun, an excellent stage in Mercury’s cycle to assimilate and integrate past reflection with focused pragmatism in the present, especially considering that Mercury is home in Virgo. Giving Mercury additional electricity is an opposition from Chiron in Pisces which can give us the courage to face whatever is arising in our environment and discern far reaching insight that can turn the tide and light a path in front of us. The key is to be present with an active and alert Mercury and find practical outlets to move the energy we receive at this time through an intentional mode of expression of our choosing. Profound insight into the meaning of our circumstances is available and with this New Moon we can focus on planting a solution to our dilemmas that we can tend with the presence of the Virgin. At the time of the New Moon, Mars in Scorpio will be entering into a conjunction with Saturn in Scorpio which is probably the most attention grabbing aspect of this time. However, throughout this past year I have been tracking the current cycle between Venus and Mars that began in April 2013, and as the exact last quarter square between them will occur soon after the New Moon while the Moon is still in Virgo, I want to delve into its meaning first. As I previously wrote about in my Mars retrograde in Libra post, we experienced a very drawn out first quarter square and then experienced the opposition of their cycle around May 11, 2014. Today at the last quarter square, Venus and Mars are not facing off by themselves, instead having each made allegiances with a powerful other. For Mars in Scorpio, it is a balsamic conjunction with Saturn occurring at the lunation, while for Venus in Leo, it is a balsamic conjunction with Black Moon Lilith. Make sure to look in your chart for where 17 degrees of Leo is for how Venus is impacting you, and for 18 degrees of Scorpio to see how Mars and Saturn are stirring things up for you. As I have been doing so far in my writing about the current Venus and Mars cycle, I am drawing upon the work of Jeffrey Wolf Green because I have found his method of exploring their cyclical archetypes to feel resonate with my own experiences as well as with people whose chart I’ve been working with. Green took the meaning behind Dane Rudhyar’s lunation cycle and applied it to the cycle between Venus and Mars through the lens of his evolutionary astrology. To start with, reflect back for a moment to the time of April 6, 2013 and what relationships and desires arose or you felt called toward. The conjunction at that time was at 20 degrees of Aries, so this cycle connects with the Mars archetype and a yearning that came out of that time for a sense of a personal destiny we wanted the freedom to pursue, despite personal circumstances that may not have been adequately aligned to manifest. Now Venus is no longer in Aries but is rather in Leo, and this means that our previously primal urge for self exploration has now developed into a fully conscious sense of our creative potential. This is because Venus in Leo possesses an inner focus that demands creative self-actualization. Venus in Leo hears the call and sees the vision, and she has the inner radiance bright enough to take a stand to actualize herself however she desires. This inner shining is an even brighter light at the moment because Venus has recently passed through a conjunction with Jupiter in Leo, and now she is joining up with the defiantly authentic and independent Black Moon Lilith, an archetype that doesn’t give a damn what you think of it. Black Moon Lilith is not afraid of being an outcast if necessary to stay true to her values, yet as Demetra George has written she is also a resolution point wherein we are not a rebel without a cause, but rather a purposeful rebel whose path takes us deeper into our core self. This vibrant Leo energy is powerful stuff for the last quarter square between Mars and Venus, because at this stage in their cycle our soul desires to expand into a more universal awareness and we desire to journey beyond our surrounding culture and society, with a willingness to let go of the limitations of our socially defined role and the culture of wherever we are currently living. At this time we may feel a desire to learn about and merge with ideas from other cultures that give us a different perspective on the meaning of our life. A crisis emerges because while we desire to live and interact within our current culture, we want to be able to do this while questioning everything about it and the meaning of everything at the same time. As a result, we may feel alienated and think about withdrawing from society. Hopefully, the presence of Black Moon Lilith with Venus in Leo will coincide with us overcoming the challenge of maintaining our integration in society while allowing for an inner expansion concurrently. This lustful Leo energy will also desire an intimate partner who shares an affinity with our soul, someone who is on a similar path with us and shares our values and passions in life. While this may seem like a typical romantic dream, at this stage in the Venus and Mars cycle it is more like an essential urge that demands satisfaction. If we are in a relationship, but our current partner is not aligned with us on a soul level, great conflicts around our values could erupt at this time. We could then experience a sense of increasing alienation in our relationship, a feeling that we have no basis of being able to relate in a meaningful way. We fortunately do have a strong Virgo Mercury right now ruling the Virgo New Moon to help us discern if it is time to set intention to leave a present relationship behind, or stay rooted and attempt to see if a mediation of differences is possible or not. In any case, conflict and criticism in our relationships will be difficult to handle with Venus in Leo, as Leo Venus wants positive feedback, and with Venus being in square to both Mars and Saturn, we may get exactly the opposite and have to face confrontations with others in relationship attempting to manipulate us or misuse their power with us in an emotional dynamic. At a pure level, Venus in Leo can have no sense of limitations and boundless desire that can become deeply frustrated when having to face the limitations of Saturn, such as societal limitations, limitations of authority over us, or limitations of time and space. With Black Moon Lilith also involved things could really become heated, yet Black Moon Lilith will be able to lend us the power to burn off the false in the fire, and emerge from conflict with a more fully realized authenticity. Remembering that we are also at the last quarter square between Venus and Saturn in their cycle, this New Moon square between them connects back to the last conjunction of Venus and Saturn on September 18, 2013 at 9 degrees Scorpio. What was shifting and beginning to come into form last September and October? This current Scorpio cycle between Venus and Saturn has been a deep one that has brought great loss and change into the lives of many. The changes can allow for a deep re-structuring of our consciousness or awareness, and today’s New Moon is a perfect time to set intention to shift into a new pattern more deeply rooted with our true desires. Mars and Saturn started their last cycle around August 15, 2012 at 25 degrees of Libra (If you would like to track this cycle farther back for increased insight, previously on July 31, 2010 there was a Mars and Saturn conjunction at 1 degree of Libra, and on July 10, 2008 there was a Mars and Saturn conjunction at 6 degrees of Virgo). We are now at the final release of this past cycle: to think of how it impacted you, look to where 25 degrees of Libra is in your chart and track the movement of Saturn deep into Scorpio where it is now, reflecting upon the events that have transpired. This past cycle initiated in Libra, ruled by Venus, has a more outward Venusian theme to it, whereas the cycle we are starting now in Scorpio will be a more inwardly deep cycle. Relationships can still be part of this cycle but they will be relationships that take us deeper into our core and soul desires. Current events are intense right now, but starting a project during a Mars and Saturn new phase can be a powerful choice for one’s self development. As a personal example, I started this blog you are reading at the previous conjunction of Mars and Saturn in Libra and it has turned out to be a great realm for me to work on my writing and research skills in connection with astrology. I did not have anyone reading it initially, but I have seen some slow and steady growth in readership, not unlike the methodical focused energy of Mars and Saturn united. When I think back to that time period in my life, I had some turbulent emotions and personal issues that fit with the intensity of Mars and Saturn coming together, and so creating this blog gave me somewhere to direct energy in a productive manner for myself. One of the reasons the intensity has been revving up so much may have to do not only with Mars and Saturn coming together in Scorpio, but also simply that we are closing out their past cycle. I am sure things will continue to be intense, but look for where things begin to shift and where openings emerge for personal pursuits as the new phase sets in during the next few weeks. It isn’t necessary to start a project at this time, but it is important to direct energy into something, be it an exercise routine, yoga routine, cooking routine, or space for creative expression of any sort that calls. If events do take us into the darker side of the possible meaning found in the Mars and Saturn conjunction in Scorpio, a good recourse will be to use it as an opportunity to learn more about our nature. In connection to the last quarter square aspect with Venus, if we are drawn into another culture, a new philosophical awareness, or a love interest we desire to become intimate with, in all cases these will be attractions and callings that are resonant with our soul desires. Pursuing a passion at this time will be a great way to work through the energy and utilize the transcendent potential of the many hard aspects involved in the New Moon. The Virgo and Pisces axis is demanding our attention this lunar cycle, as we begin with the New Moon opposite Neptune in Pisces, ruled by a Mercury opposite Chiron in Pisces. The climax will be a Super Moon in Pisces on September 8, 2014 that will be conjunct Chiron in Pisces, with Venus in Virgo in opposition to Neptune in Pisces. Some of us are able to tune into Neptune and Chiron more so than others it seems without becoming baffled, but whatever your prior orientation is to the far out Chiron and Neptune, start paying attention. We have a full plate ahead of us involving Neptune and Chiron in Pisces to digest (fortunately Virgo is associated with digestion, ha ha). 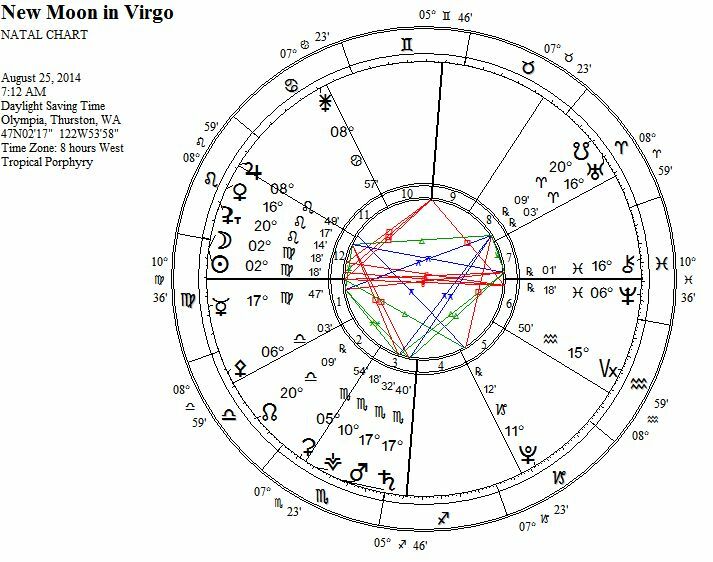 Demetra George has labeled Mercury in its current evening star phase more than fifteen degrees in front of the Sun as being similar to his exaltation in Virgo and what do you know, Mercury is actually in Virgo right now to boot. To Demetra, Hermes in this phase is an older, wiser Mercury who is the sage and educator of youth, an inventor of letters, interpreter of words, and giver of medicine. This is a Mercury in Virgo at a stage well suited to oppose Chiron in Pisces and evaluate our current predicament to receive a significant message, insight, or solution. Remember that Mercury is magical and that he knows how to create remedies and find solutions, and that Chiron is the mentor of heroes who can help charge us forward toward achieving a harvest from what we plant as intention on this New Moon. Mercury in Virgo opposing Chiron in Pisces is harmoniously supporting the Mars and Saturn conjunction, with Mercury sextile and Chiron in trine. Since both Chiron and Mercury in myth prescribe medicine, as a result they are in position to help us find a remedy for anything weakening our system. Finally, Ceres in Scorpio is harmonious with this New Moon, in sextile to the lunation and in trine to Neptune in Pisces. If we are facing issues involving attachment and letting go, we can have no better soul worker on our behalf than Ceres, as she was forced to face ultimate lessons involving letting go of attachments through losing her daughter Persephone to the underworld. With the New Moon opposite Neptune, Ceres being involved harmoniously can help us mother ourselves, as a Moon and Neptune opposition can relate to desiring an illusory attachment in order to compensate for attachments that we feel were taken away too soon. As a result we can experience great disillusionment when the new attachment we thought would take care of everything wrong in our life doesn’t live up to our projected ideal. I do not think it is necessarily bad to want to attach to someone or something at this time, but I do think it is good advice to avoid losing your sense of self in the process. Invoking some Taurus self-reliance as an antidote to all of the Scorpio energy can help us successfully merge with another without losing ourselves in the process. As I previously mentioned, there can be a genuine desire for a soul mate in connection with the last quarter square between Venus and Mars that is not an illusion. Just practice discernment as best as you can. The story of Ceres is also a lesson that if we are feeling anger, pain, or sorrow, it is better to express the emotions through an outlet rather than try to numb it through the use of drugs or other forms of escapism. There is strong association between Ceres and the sign of Virgo for obvious reasons, but an additional connection is her extreme productivity and ability to cultivate and nurture growth on all levels of being. The type of growth we will experience at this time will not be light and airy but instead dense and deep. Use the New Moon to focus on your true heart’s desire and then use the conjunction between Vesta and Ceres in Scorpio to dedicate yourself to maintaining your focus on making it happen. Every small choice and step along the way will add up to the grand life we are desiring to live. The last quarter square between Venus in Leo and Mars conjunct Saturn in Scorpio is a temporary passage along the way there. Thank you Judie! Unfortunately I only know the basics of wordpress and only how to create a blog here. I am not sure how you would insert it into your existing website besides just making links. Maybe for now just an eye catching link? If I come across someone I will let you know. That is exciting that you have a book coming out! I am curious to find out what it is about. About Arizona, if you mean the ISAR conference, no I will not be there. I have noticed that many big name astrologers will be there so I if that is what you are referencing and if you are going, I hope you enjoy it. I served as an audio recorder at this past year’s NORWAC conference and enjoyed the lectures- for working I got free audio recordings of additional lectures that have been great to listen to. Enjoy! Hi Gray. Great work on these last two pieces. Particularly the dates and interpretations from 2008 on. They are exact — Hermione would approve. 2014 has been an amazing! My chart is still being hit pretty overtly, but it’s been feeling hugely liberatory throughout August. Venus/BML is on my North Node and Mars/Saturn on my Uranus/Vertex as part of my Fixed Cross, but you know that’s my most favorite part of my cross. It feels awesome… ridiculously serendipitous… and funny! I’m loving this energy. Finally! And it seems right as a development from the Aries energy. Your breakdown of the interactions of the signs over time is perfect. It’s great to hear from you Kelsey, and nice to receive validation from someone I know capable of critical analysis. I’m glad to hear that you are doing well with all of the aspects hitting your chart. It makes me wonder if you navigate more smoothly with planets hitting the exact angles in the four fixed squares in your chart rather than harsh aspects in between or hitting other aspects in your chart involved in it. Or maybe its just that you are really flowing into your north node in a good way now in aspect to your Uranus and Chiron. Seems like Venus and Black Moon Lilith on your North Node would be magnificent for you. Whatever the case, it’s awesome to hear that you are having some fun. I’m also psyched that Hermione approves. Ya, I’ve been surprised by how good this Leo energy has felt to me. And I like Venus with BML on the Node. It feels like waking up to ease of something… but by confronting every edge. You, your article here, has been a great mirror and confirmation to me. Thank you so much!